A fisherman lights a lantern next to a fyke net on the shore of the Union River in downtown Ellsworth last month in hopes of attracting baby eels into the net. The value of Maine's 2018 baby eel fishing season has surpassed $20 million, its highest value since the state implemented a statewide catch limit for baby eels four years ago. The value of landings so far in Maine’s 2018 baby eel fishing season have topped $20 million, the fishery’s highest annual value since the state adopted a statewide catch limit in 2014. Record prices this season of around $2,500 per pound for baby eels, also known as elvers, already have made the 2018 season the third-most valuable ever in Maine. Over the past four years, the highest annual landings total for the state’s baby eel fishery, which lasts from late March through early June, is $13.4 million in 2016. According to Maine Department of Marine Resources, as of Wednesday evening fishermen had caught 8,416 pounds, or 87 percent of Maine’s annual catch limit of 9,688 pounds. The department estimated that, with fishermen getting paid an average of $2,443 per pound for their catch so far this season, the value of the statewide haul on Wednesday was $20,560,000. If the per-pound price offered to fishermen by buyers remains around $2,400 per pound, there could be another $3 million worth of elvers to catch this spring. The season ends either when the statewide catch limit is reached or on June 7, whichever comes first. 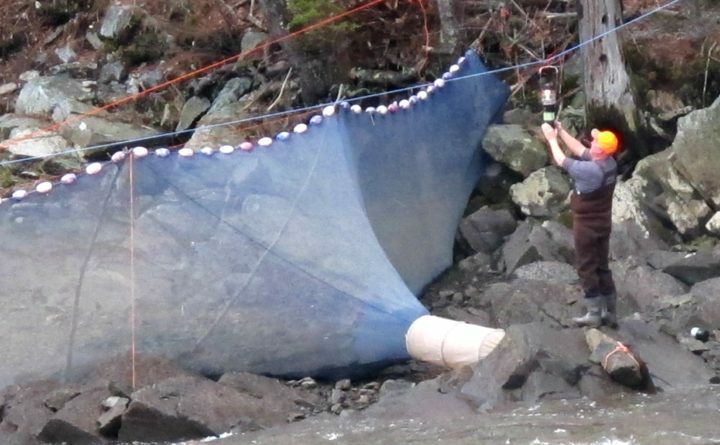 Maine’s highest catch totals for elvers occurred in 2012 and 2013 — when there was no catch limit in the state — with harvests worth $40 million one year and then $33 million the next. Like it was in those two years, the elver fishery is expected this year to rank as the 2nd-most valuable in Maine, behind only Maine’s dominant $433 million lobster fishery. The highest season-long, per-pound average price for elvers in Maine was $2,171 in 2015, when a fairly cold spring resulted in fishermen catching only 5,260 pounds for the season. Elver landings in Maine that year had a total value of $11.4 million. Global demand for elvers caught in Maine have been high since 2011, when an earthquake and tsunami in Japan destroyed much of that country’s cultivated eel stocks. The disaster struck months after the export of European eels was banned due to concerns about declining eel populations there. The only states where elver fishing is permitted are Maine and South Carolina, which has a fishery much smaller than Maine’s. The vast majority of elvers caught in Maine are shipped live to Asia, where they are raised in aquaculture ponds to adult stage and then harvested as seafood. Concerns about the health of the American eel population led the Atlantic States Marine Fisheries Commission to impose a statewide catch limit in 2014. Maine’s catch limit that year was 11,749 pounds, but it was reduced to 9,688 pounds the following year. Despite the commission’s concerns, the U.S. Fish & Wildlife Service decided in 2015 against listing the species under the Endangered Species Act. The interstate fisheries commission is again considering whether it should raise Maine’s annual elver quota to its 2014 level of 11,749 pounds — which, at this year’s prices, would increase the value of Maine’s annual elver harvest by roughly another $5 million. Public hearings on the proposal are scheduled for 3 p.m. Wednesday, June 6 at Jeff’s Catering in Brewer and the following day at the same time at DMR’s offices at 32 Blossom Lane in Augusta.